In broad usage, the term "fisheries" refers to the capture and processing of sea, coastal, and inland aquatic animals and plants for commercial, recreational (sport), or subsistence (survival) purposes. The term "fishery" could refer to a small fresh-water stream, one of the Great Lakes, or the entire Atlantic Ocean. Yet "fishery" commonly is applied to a specific area of water where fish are commercially harvested from wild stocks (populations), and "fishery (or fisheries) management" refers to its associated management. Although sport fishing, aquaculture , and the harvesting of aquatic animals or plants are sometimes categorized under fisheries management, this article addresses only fresh-water capture fisheries. A few examples of fisheries worldwide are presented. Some fisheries such as the Great Lakes in North America and Lake Victoria in Africa support a commercial harvest that is exported and marketed away from the source. Other fisheries produce large quantities of fish, but most or all of the catch is consumed locally, so the economic importance is harder to measure. Examples of the latter include the Amazon and its tributaries in South America, the Chang Jiang (Yangtze River) in China, the Tonle Sap River in Cambodia, and the Mekong River in Vietnam. The Great Lakes range from cold, deep, clear water with heavily forested shorelines such as Lake Superior to the warmer, shallower water of Lake Erie surrounded by farms and urban areas. The cold, clear waters produce desirable species such as whitefish, trout, and salmon. The warm waters of Lake Erie with their heavy nutrient load are more biologically productive, but the varieties of fish taken generally are less commercially desirable species, such as varieties of buffalo shad and white perch. Although Lake Erie still supports one of the largest commercial freshwater fisheries in the world, commercial fishing on all the Great Lakes is declining. Africa's Lake Victoria is the world's largest tropical lake and the world's second largest fresh-water lake. In the past, Lake Victoria supported a wide variety of fish species as well as an important subsistence fishery along its shores. However, years of abuse have dramatically altered the lake. The shores have been cleared for cash crops of tea and coffee, while its marshes have been drained. Agricultural chemicals applied to the area around the lake eventually end up in the lake. The biggest change has come as the result of the introduction of the Nile perch. Frozen Nile perch fillets are sold throughout Europe and are a valuable export commodity. However, local small-scale fishing is being pushed aside by large-scale commercial fishing using modern technology. 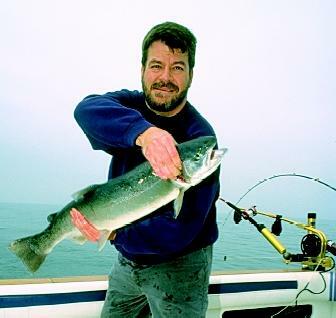 Steelhead trout are one of the important cold-water fish species in Lake Michigan. Lake Michigan steelheads are wild hybrids. fisheries. Fish from the Amazon also are an important export to Asian countries, especially Japan. The Chang Jiang or "Great River" at 6,380 kilometers (3,960 miles) is the longest river in China and Asia, and the third longest in the world. It also supports a highly productive fishery. In recent years, the average annual catch has dropped from over 400,000 metric tons to about 100,000 metric tons. The Tonle Sap is a wide lake in Cambodia. Tonle Sap means "Great Lake." Tonle Sap is also the name of the river that runs into the lake. It is the largest body of fresh water in Southeast Asia and also is one of the world's most productive inland fisheries. During floods, both the Tonle Sap and Mekong River water levels rise until the Mekong spills over into the Tonle Sap. This complex relation, along with the surrounding wet-lands , accounts for the extraordinary productivity of the lake–river complex. Most of the annual catch of 110,000 metric tons is consumed locally. Most of the 60 million people who live in the Mekong Basin in Vietnam depend on fish for their entire animal protein intake. These local fisheries are vitally important for nutrition of some of the world's poorest people who otherwise would be unable to afford a high-protein diet. Sale of fish and fish products also is an important income supplement for many families living in the basin. By some estimates, the Mekong and its tributaries alone contribute 1 percent of the global fish harvest. Worldwide, all fisheries are threatened by various factors. Pollution , loss of habitat , invasive species, parasites, illegal fishing methods, and overfishing are some of the more serious threats. All of the world's fresh-water fisheries face some type of threat from pollution. Lake Victoria is threatened by agricultural runoff and industrial waste. The Chang Jiang is the cleanest of China's rivers, but still threatened by pollution. And completion of the Three Gorges Dam (scheduled for 2009) will reduce flow in the lower river, which in turn may allow contaminated sediments to build up. In recent years, fishing on the Chang Jiang has been severely affected by environmental pollution, construction of irrigation projects, and the reclamation of land from lakes. In North America, chemical pollution is a great concern in the Great Lakes region because of its heavy industrial and urban centers within larger agricultural areas. The Lake Erie catch of whitefish (a desirable species) collapsed in the 1960s, partly due to the effects of agricultural chemical runoff. Whitefish populations in Lake Superior and Lake Michigan already were reduced as a result of parasitism by sea lampreys. Since the 1960s, the white-fish catch has been steadily increasing as efforts to reduce water pollution and control the sea lamprey had been successful. At the same time as the whitefish take was declining, the tons of carp harvested per year steadily increased. This is one of the ironic aspects of this type of pollution. The lake remained very productive, but carp and the other kinds of fish taken were less economically desirable, so the income from commercial fishing dropped. Habitat alteration is possibly the most serious threat faced by fresh-water fisheries. For example, dams are being built in the Chang Jiang basin. Lake and river shores are being deforested in the Amazon River Basin, around Lake Victoria, and on the banks of the Tonle Sap. Lakes are being filled to create new agricultural land on the Chang Jiang. All of these activities degrade the quality of the fishery. However, managing these problems is a complex issue involving socioeconomic and political factors as well as fisheries management strategies. More than 140 invasive species have been identified in the Great Lakes. Most have appeared since the St. Lawrence Seaway opened in 1959. Sea lampreys in the Great Lakes are a notable example of the damage that can be done by an invasive species, and of the success of fisheries management strategies. Because sea lampreys are not native to the Great Lakes, there were no natural controls and their numbers rose dramatically. Parasitism by sea lampreys nearly destroyed the whitefish and lake trout fisheries by the 1950s. Control efforts eventually resulted in a 90-percent reduction of sea lamprey populations in most areas, generally restoring a healthy environment for fish survival and spawning. However, ongoing control costs the United States and Canada more than $12 million annually. Controlling the sea lamprey is a success story, but other invasive species such as the zebra and quagga mussels remain serious problems. Controlling invasive species and preventing future invasions must remain a top priority for fisheries managers. Fisheries biologists use a weak electric current to stun fish temporarily so they can be identified, measured, and tagged. Accurately assessing fish populations is a critical component of fisheries management. Parasites are of concern for several reasons. Parasites may have been keeping a nuisance species in check in its native habitat. In the absence of those parasites and other predators, the nuisance species can grow exponentially. On the other hand, fish weakened by nonnative parasites, such as the sea lamprey, are likely to die either from their weakened condition or from secondary infection. Exotic species also can introduce nonnative parasites into an ecosystem . An example of this is whirling disease, a potentially fatal condition that appears in young trout and salmon. The disease, which may have been introduced through fish stocking programs, is caused by a nonnative parasite that infects the fish cartilage and nervous system. It is found in at least eleven western U.S. states. The Madison River in Montana has suffered a 90-percent decline in rainbow trout populations since the disease first appeared. Several parasites of mussels also have been accidentally introduced into U.S. fresh waters. Among other threats, the Chang Jiang River ecosystem is threatened by illegal fishing activities. In 1999, about 3,000 people were arrested for using poisons, electrical shocking systems, and other illegal methods to take fish. The fishers are trapped in an economic spiral. Pollution, dams, and draining of lakes, all ecosystem threats in themselves, reduce fish populations. This forces the fishers to turn to more economical and possibly illegal methods to catch more fish. Other fisheries worldwide are threatened by illegal fishing. Overfishing and Depleted Wild Stocks. A notable example of the consequences of overfishing is the herring fishery in the Great Lakes, which has been severely depleted. Similarly, the abundance and variety of Lake Victoria fish has dramatically decreased due to overfishing. In the Tonle Sap Lake and River, competition between government licensed commercial fishermen and local people who fish for food for their families (i.e., subsistence fishing) has led to overfishing. Modern fresh-water fisheries management takes an ecosystem approach. This approach to fisheries management recognizes the interrelationships between air, land, water, and all living organisms, rather than focusing on a single aspect. Ecosystem-based fisheries management tries to move beyond political boundaries and look at natural boundaries, such as watersheds (drainage basins), as the unit of management. An ecosystem approach includes the whole system, not just parts of it. Ecosystem approaches also incorporate the concept of sustainability . Ecosystem approaches look for long-term solutions rather than short-term fixes. Strategies that can be used successfully by ecosystem-based fisheries management include temporary fishing bans, catch limits, size limits, and habitat improvement. In addition, captive breeding and restocking may be used to rebuild depleted populations. Strict enforcement of laws and catch limits also may help. For example, the countries surrounding Lake Victoria have instituted a series of temporary fishing bans to allow wild stocks (populations) time to recover. But agricultural runoff and industrial pollution continue to threaten Lake Victoria. As of 2002, Lake Victoria remained a severely damaged ecosystem that will require dramatic efforts to rescue. The ecosystem management approach has been most successful in the Great Lakes. While serious problems remain, there are several successes. The herring stocks are rebounding due to fishing bans and restocking programs. Various kinds of water pollution have been reduced or eliminated. The Future of Fresh-Water Fisheries. Commercial fresh-water fisheries have never been as economically important as commercial marine fisheries, except in certain local areas such as the Mekong River Basin. Only about one-fifth of the world's total fish catch comes from fresh-water fisheries. Furthermore, the economic importance of fresh-water fisheries worldwide is diminishing. Depleted fish populations and various other threats continue to make the harvesting of wild stocks uneconomical. Aquaculture is becoming increasingly important and is displacing the commercial harvesting of wild stocks. Capture fisheries now account for less than half of all fresh-water fish consumed globally. SEE ALSO Aquaculture ; Fisheries, Marine ; Great Lakes ; Pollution by Invasive Species ; Salmon Decline and Recovery . Avise, J. C. "Flocks of African Fishes." Nature Vol. 347 (1990):512–513. Maitland, Peter S., and N. C. Morgan. Conservation Management of Freshwater Habitats: Lakes, Rivers and Wetlands. Boston, MA: Kluwer Academic Publishers, 2001. Ross, Michael R. Fisheries Conservation and Management. New York: Prentice Hall,1996. Templeton, Robin G. Freshwater Fisheries Management. Oxford, U.K.: Blackwell Science, 1995. Welcomme, R. L. Inland Fisheries: Ecology and Management. Oxford, U.K.: BlackwellScience, 2001. Williams, J. E. et al. "Fishes of North America: Endangered, Threatened, or of Special Concern—1989." Fisheries 14(6):2–20. Aquaculture Program. U.S. Department of Agriculture, Agricultural Research Service. <http://www.nps.ars.usda.gov/programs/programs.htm?NPNUMBER106> . 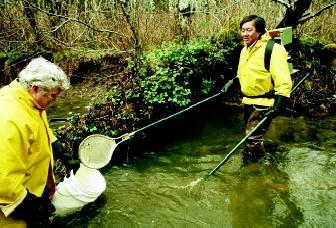 Fisheries FY2000 Accomplishments. U.S. Fish and Wildlife Service. <http://fisheries.fws.gov/FISA/FY2000/> . In the last sentence in this paragraph starting with "The lake"